Enchantment Tour of Bali Island is not only in the mainland. Bali also has other beautiful islands worth to explore its charms one of which is the island of Nusa Penida in the east of Bali Island. namely, beach Pasih UUG Nusa Penida Bali or Broken Beach Nusa Penida. The island has many interesting and beautiful attractions to be enjoyed one of which is Pasih UUG Beach located in Banjar Sumpang, Bunga Mekar Village, Nusa Penida Sub-district, Klungkung Regency, Bali Province, Indonesia. Pasih UUG Beach or better known as Broken Beach Nusa Penida or billabong beach Nusa Penida is like a sea separated from the open sea. The sea water passes through the cliffs and is trapped between coral cliffs which then form a gigantic natural pool with a cliff height of about 50-200 meters. 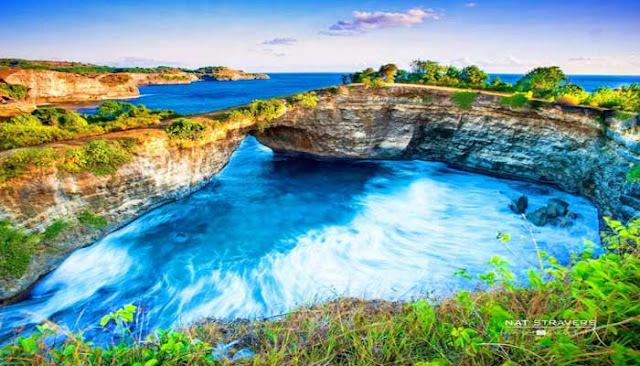 Above the ridge that forms a hole also looks like a natural bridge, It's a very unique and exotic scenery that you can only find in Pasih Beach UUG Nusa Penida Bali. On the beach, Pasih UUG is very exotic and much admired by tourists both local tourists and foreign tourists. Relaxing by the beach with the serene wave or the challenge of conquering the waves big enough you can easily get on Nusa Penida beach Bali. In addition to having a natural charm that is really amazing to enjoy, the coolness of the air by the breeze that blows will make you feel at home lingering on this beach. Feels comfortable, calm and soothing. If you are lucky, you can also find Manta Stingrays and Sea Turtles swimming around cheerfully around Pasih UUG Beach. And this is the best place to visit in Nusa Penida. If you are interested to visit Pasih UUG Beach in Nusa Penida, you can visit it from Sanur Beach by using speedboat with travel time about 30-45 minutes or by ferry from Padang Bai to Nusa Penida and then by car or motorcycle rental you can to Pasih UUG Beach or Broken Beach Nusa Penida with travel time about 1.5 hours.